Drinks and snacks before dinner with Mark’s parents. 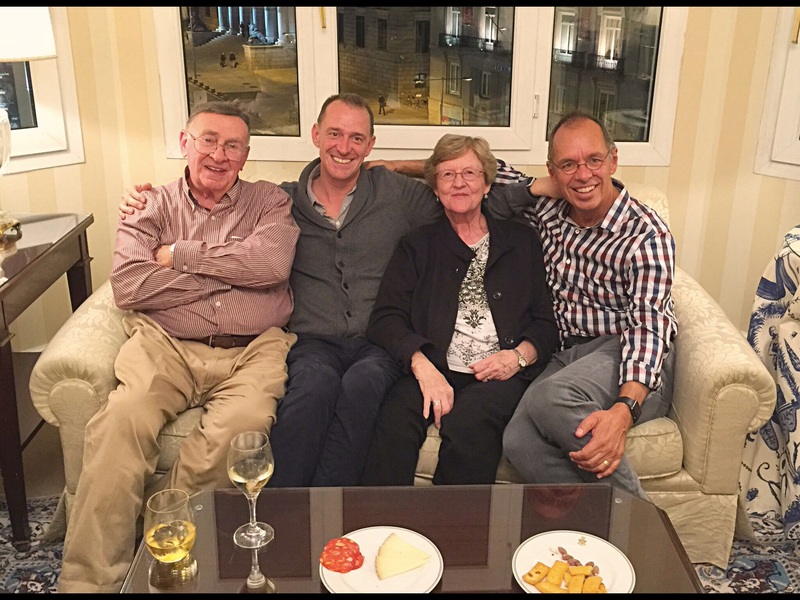 We’ve been very lucky to be able to meet up with family and friends periodically throughout this adventure. Northern Spain – Basque Country, specifically – is both Spain and not Spain. It has its own language, utterly unrelated to Spanish or any other known language, and its own culture and history. One notable difference between Basque Country and the rest of Spain to the south is that Basque was never conquered by the Moslems. So after our short week in the north we caught a bus – a very fancy, comfortable bus that Mark immediately dubbed “pimped out” transportation – down to Madrid. That’s real Spain. 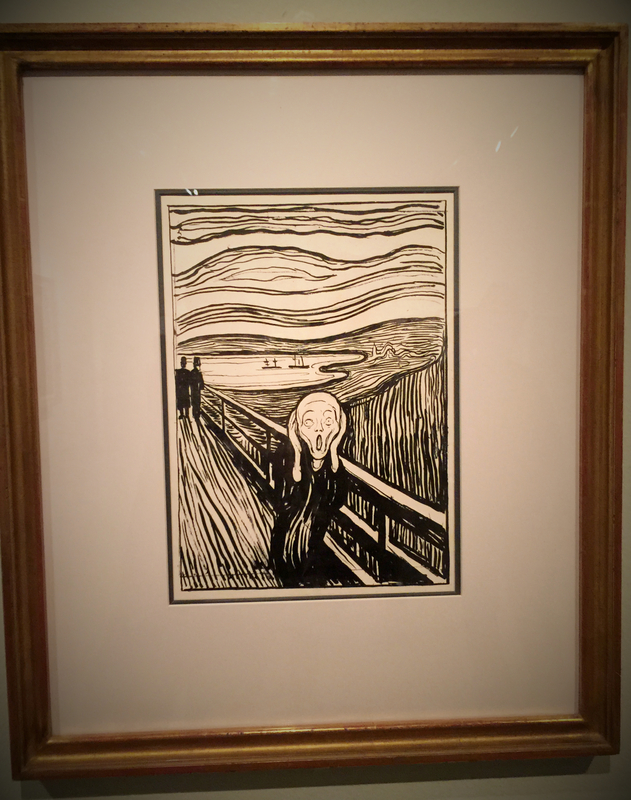 The Thyssen Museum had a special Munch exhibit, the Norwegian artist most famous for The Scream. His work was genuinely interesting though, to put it mildly, often depressing. 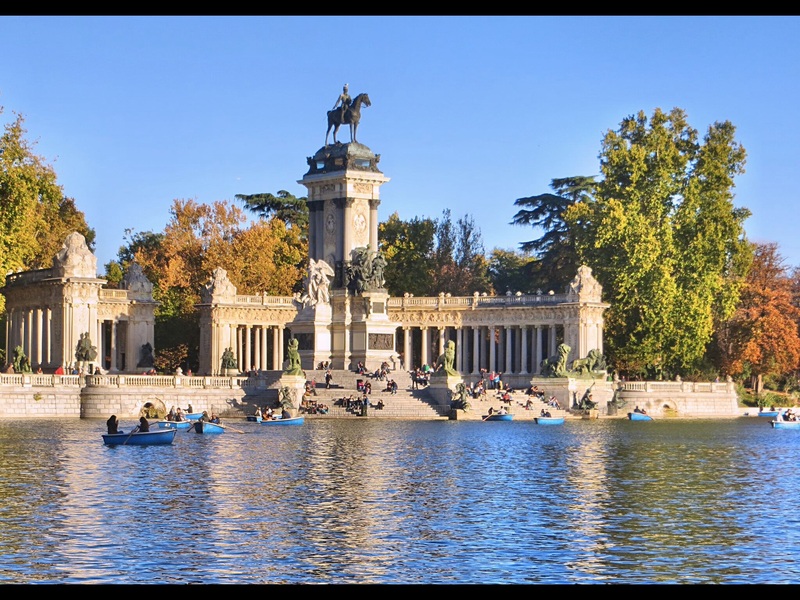 Madrid has been the Spanish capital since 1561, when King Phillip II moved it here from Valladolid. Walking around the city today you are reminded of the incredible wealth and power that once was associated with the Spanish kingdom, great palaces and parks and spectacular art, much of it financed with gold from the Americas. As crazy Republicans supporting Donald Trump should remember, though, even great powers can be brought to heal by weak, unqualified leaders. The big deal in Madrid are the art museums, particularly three huge world-class museums: the Prada, Spain’s national art museum specializing, not surprisingly, in Spanish art; the Thyssen Bornemisza Museum, a broad collection that was once the second-largest private art collection in the world; and the Reina Sofía Museum of modern, mostly Spanish, art. We spent a lot of time in each of them, during which I saw more Goyas, Velázquezes, Picassos, Dalís, Titians, and El Grecos than I’d ever imagined. Rooms full of amazing art, where you stumble onto the random Van Gogh or Rubens. The highlight though, hands down, was Picasso’s Guernica in the Reina Sofia. Sometimes you can see one of these classics and think “OK, I can check that one off.” So not the case here; it’s a blow-your-mind kind of experience, arguably the most powerful anti-war artistic statement of all time. I got goosebumps standing in front of it and almost couldn’t tear myself away. This photo can’t possibly do Guernica justice. And it’s worth pointing out that the piece is massive: over 11 feet high and over 25 feet wide. Powerful stuff. The background is that, early in the Spanish Civil War of the 1930s, Nazi Germany was supporting Franco’s fascists and bombed the northern Spanish city of Guernica. The Republican government asked Picasso to memorialize the destruction for the 1937 World’s Fair in Paris. From there it went to the Museum of Modern Art in New York, as Picasso specifically asked that it not return to Spain until freedom and democracy had been reestablished. In September 1981, following the death of Franco in 1975 (Picasso had died two years earlier) and the reestablishment of democracy in Spain, the painting returned to Spain. One can only imagine the pride and excitement its return generated; nearly a million people viewed the exhibit in its first year back in Spain. Of course, one can also only imagine the depression experienced by MOMA officials in New York on losing their masterpiece. You’ll notice no discussion of food in Madrid. After Bilbao and San Sebastián, Madrid was a real let down. 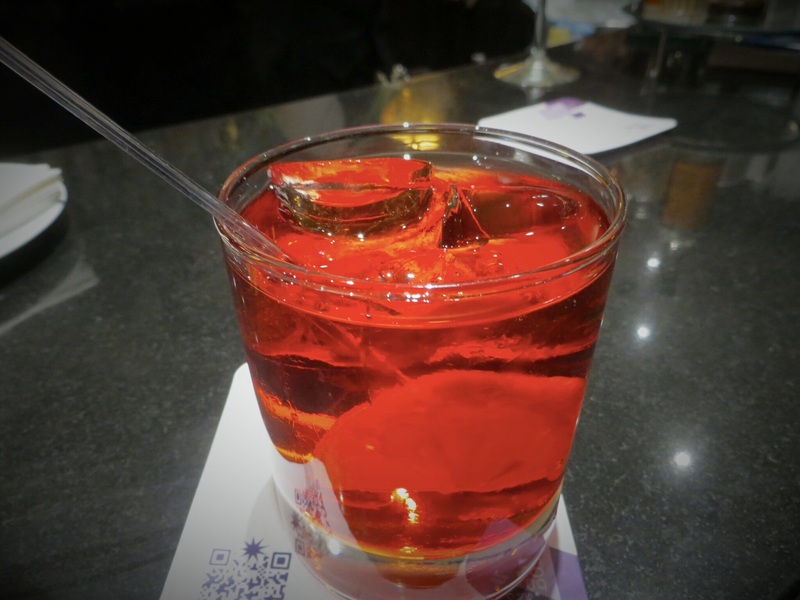 We did, however, find a just-about-perfect Negroni and that counts for something! Some of the background of the Thyssen is fun. The museum is based on what was once an enormous private collection started by Heinrich, Baron Thyssen-Bornemisza de Kászon, a German-Hungarian industrialist. His son Baron Hans Heinrich Thyssen-Bornemisza (I love those names) added to the collection, joined by his wife María del Carmen Rosario Soledad Cervera y Fernández de la Guerra, Dowager Baroness Thyssen-Bornemisza de Kászon et Impérfalva (did I point out that I love those names?). This wife, I should add, is a former Miss Spain and his fifth wife (might just be the definition of “trophy wife”), but that’s OK because he was her fifth husband, too. The museum was supposed to be in Lugano, Switzerland, where they have a big home but the Lugano government wouldn’t approve the construction permit so they said “Fine, we’ll put it in Madrid.” More recently, the Miss Spain widow (the second Baron died a few years ago) was dinged for using international tax havens. Her explanation was that she needed to because otherwise it’s so difficult to move art from one country to another. And you think you have problems! In his absence she continues to collect art and plays a major role in managing the museum. Nothing more, I just love those names and all the multiple marriages. And the Miss Spain reference. What else did we like about Spain? I should have mentioned this up front, but we had dinner one night with Mark’s parents. They’re in Spain on holiday and were working their way from south to north and as we worked from north to south we crossed paths in Madrid, their last stop. We had a fabulous suite at the Westin right near all the museums where we hosted them for happy hour before a fun dinner. (Suite, you ask? Yup, we’d used points for the cost of a normal room and then they upgraded us to the suite. That pretty much defines sweet, eh?) It was a short visit, but great to see them. 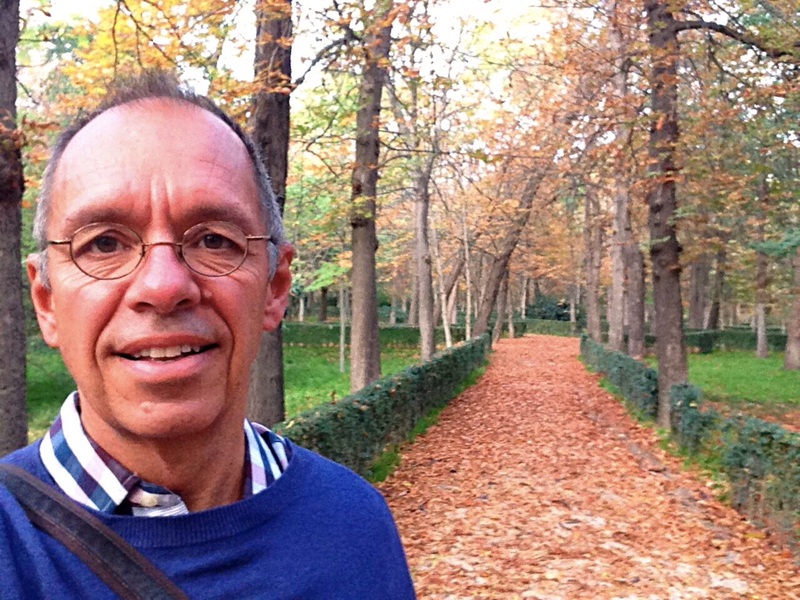 A late afternoon selfie in Buena Retiro Park. 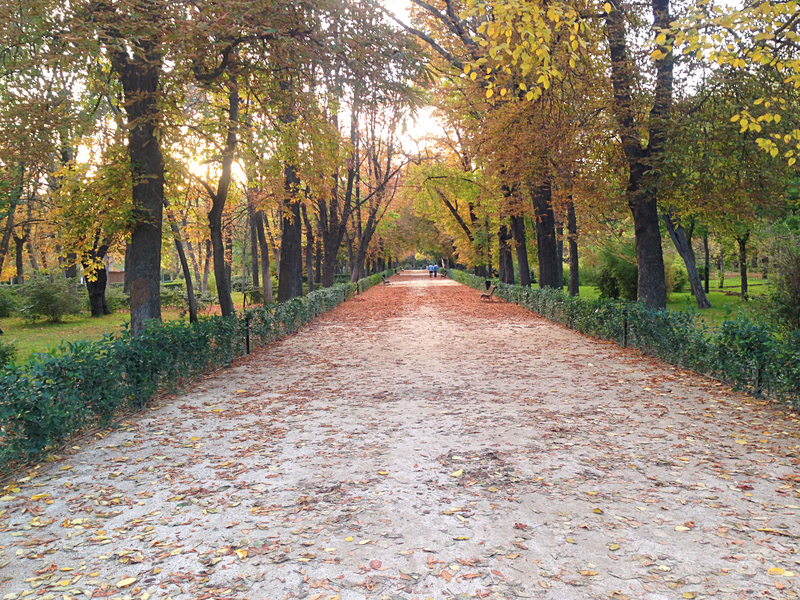 There were cute paths like this, statues, big open spaces … a pretty great park in the middle of the city. And then finally, a highlight for me was the Buen Retiro (Pleasant Retreat) Park, founded as a private royal park in 1631. It was just a half-mile or so from our hotel and, at 350 acres, has room for walking, running, reading, strolling, wandering, biking … you name it. So my mornings were up before daylight for a run in the park, while my later afternoons were back there to walk and read. 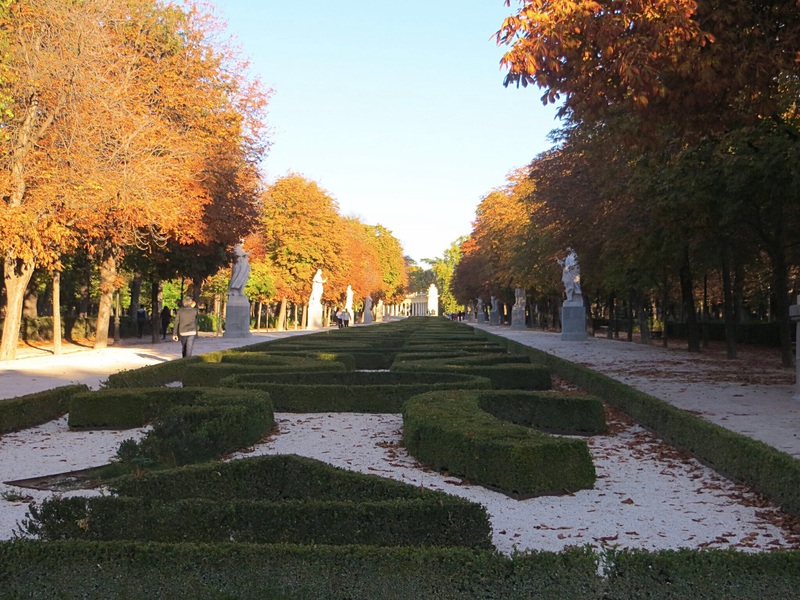 Since most of the museums don’t want you to take pictures – and even if you can, they’re not that interesting – most of my pictures from Madrid were in the park. Enjoy them!